If you are looking for that perfect getaway that won't cost you a fortune then you have come to the right place! 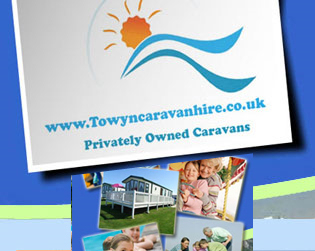 Towyn Caravan Hire caravans are all sited in and around Towyn and Abergele, North Wales. We have a great selection of static holiday homes for hire to suit everyones taste and budget, each of the caravans listed are for hire by their respective owners putting you in direct contact. Save time and money looking through local papers and classifieds trying to find that perfect holiday, you can even see the holiday home before you get there eliminating guess work! Towyncaravanhire.co.uk has been created to act as a medium for holiday home owners to come together and advertise their holiday homes to a world wide audience in the cheapest and most effective way. This makes it easier for the customer to find accomodation they are looking for, all ads have full colour photos and detailed description.